One way to see if a tea plantation is organic is to look between the bushes. Like reading between the lines, it's not the tea tree that tells you if it's organic, but the space between the bushes. On the left, grass is allowed to grow, because no herbicides were used. This is not the case on the right hand picture. The farmer wants a high yield of leaves and that all the nutrition of the soil goes to the leaves. Other plants growing between the bushes would lower his yield. So, farmers either use herbicides or a lot of manpower to cut these plants. (This organic method will let the plants decompose around the bushes and give them natural food). This is one of the most visible clue to see if a tea plantation is organic or not. 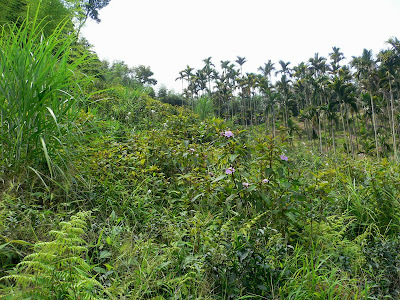 The grass and other plants are as high as the tea bushes. I hope that you can still see the tea bushes! (The luanze Oolong leaves are dark). This plantation is more than organic. It is abandoned! The farmer has retired, but no one in the family has taken over. This diverse vegetation creates a wonderful view and feeling. Still, this plantation still doesn't qualify as wild, because the trees have been planted by man. 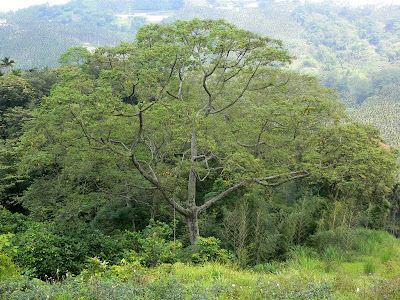 -Wild tea trees are extremely rare in Taiwan.- But it is much more natural than organic plantations on which farmers are active to fight against the invasion of other plants. 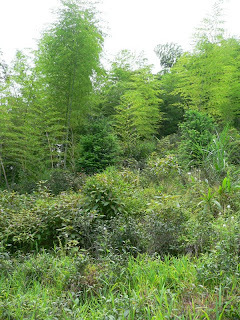 That's why I call this kind of plantation 'semi-wild'. Somehow surprisingly, the leaves here look less healthy than in a managed plantation, where they'd all point to the sky. They have to compete with other plants for nutrients. Did you notice the small red spider on the back of the black spider. It's not a baby, but the male! For us, the most important insect in this field is the tea jassid, jacobiasca formosana Paoli. It is the same insect that also bites the leaves of Oriental Beauty. 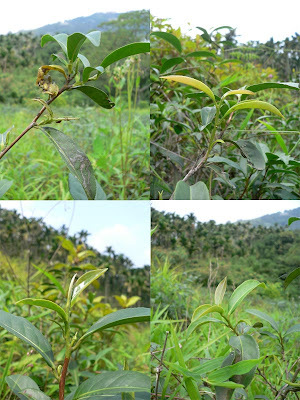 It feeds exclusively on tea buds and young leaves, which are the leaves that are harvested to make tea. And if I could take a picture of one, there must be many more in this field. Interestingly, the retired farmer let my farmer harvest this field last month, and I was able to purchase this special production. Tasting notes will follow. 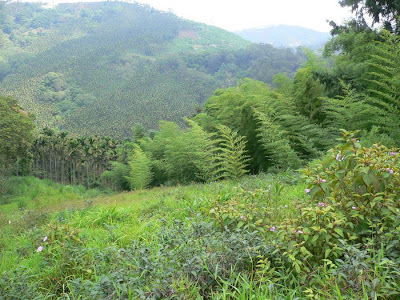 Very good article about organic tea farming. 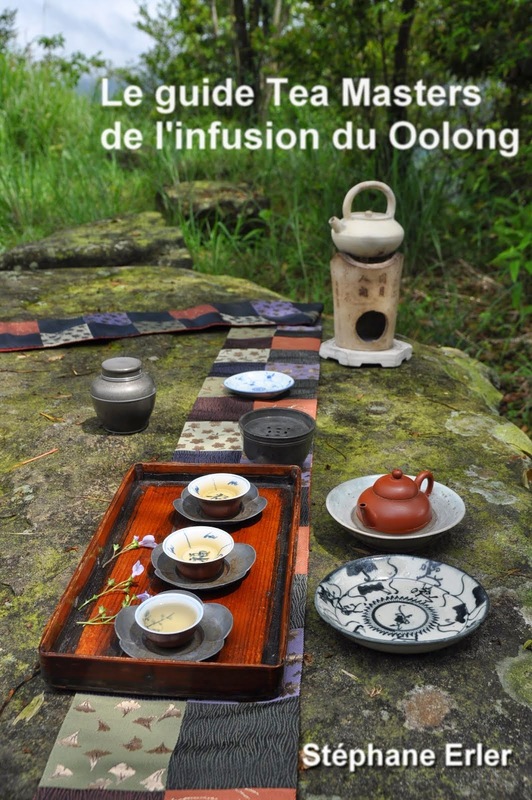 I really agree, how a tea plantation can feel so abandoned and stop giving out large beautiful tea leaves because her farmer failed to give her what she need to bloom: The farmer´s personal attention, care, and time. As the article says some farmer may look for tenants to care the farm for him, but exactly like the article illustrate here, the tea harvest of course goes to the tenant and not the farmer. There is a chinese saying: The ox (or farmer) is slow but the earth (the tea)is patient. But the saying forgot to include that the earth´s patience may run out in the end too, under extreme circumstances. Oh, and just wanted to add, that I hope the farmer understands that in the natural circle of life, that farmer comes to the farm, that there is no such thing as the earth coming to the farmer. A little bit of topic but still relevant: That even if a farmer with hunting instinct and uses trap method. Still in the code of hunting it is clearly stated that the trap should be made EASY for the prey to fall on the farmer´s trap. Thanks for your comments. You are right to point out that the care of the farmer is also something good for the tea. It may well be that the tea trees will disappear in a few years, for lack of attention. Thank yo for the answer. It has actually given me immediate questions and counter comments, but before I did that, I read the article again, becuase although I´m a teadrinker but I know very little about tea. Is wild or half wild tea better than attended, because of insect bites etc, you mean?...healthier and stronger too? I don't like to say it's better. There are just too many variables going in what makes the quality of a tea. The plantation's management is just one criteria. Elevation, location, season, process... are other variables that influence quality. 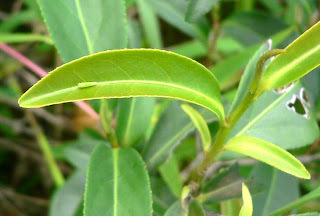 The insect bites change the taste of the tea, because the leaf starts to oxidize when it's bitten and fights against the bite. So, such leaves are not a good fit for green tea or low oxidized Oolong. 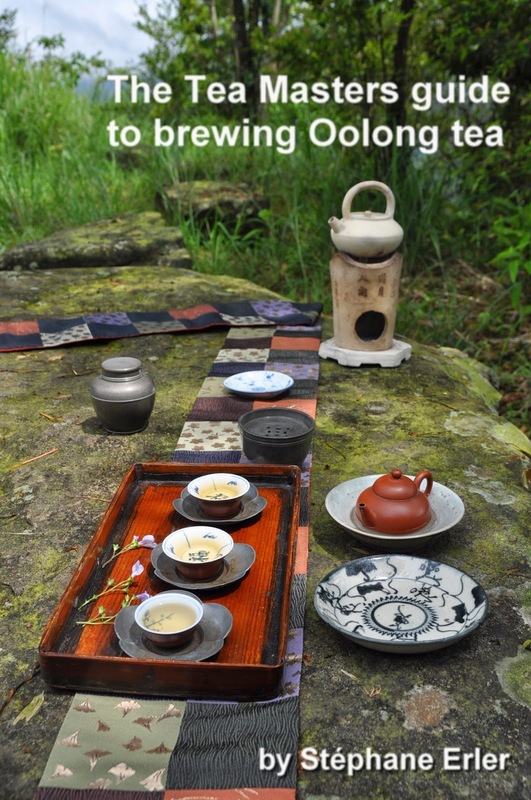 However, for higher oxidized Oolong, they bring a special taste. These more natural leaves feel more robust than ordinary plantation leaves. Thank you. These are really valuable tea information I never knew before. I also noted your statement about the leaves´ appearance sometimes not exactly justifying its quality. I never knew it can be that way before. Interestingly, the different variables that enfluence tea quality/character were somehow in my head all the time, although now after your proffessional explanation, somehow the picture of the whole process is more clearer. Categorized. Amazing. And likewise with the subject initially discussed in the beginning: tamed, wild or half wild tea, as you stated in your remark too, somehow in the end need some sort of personal engagement, even just by perhaps picking them when the right time comes by a farmer or any other intresse,and be drank and appreciated. Otherwise it´s a pity if those tea, as you said, may just dissapear for lack of attention, teas which after developing its own character, actually exist there perhaps meaning to be consumed and appreciated afterall. This has been very enlightening and rich of knowledge. Looking forward to more information like this in your blog. I'm sure this sounds presumptuous but I just arrived in Taipei and I do love tea and ceramics. Do you have any specific suggestions for where to go. I could spend hours reading back posts on your blog but if you're blog is like my blog there are just too many post. I really just want a beautiful place to drink tea. I suggest the Wisteria at Hsin Sheng South Rd, Sec 3, Lane 16, No 1. Or, if you have transportation and tea accessories, I suggest brewing tea in the mountains around Taipei, preferably close to a tea plantation. Thanks for your visit and comment, Aeyal! A very interesting article, Stephane ! It brings a bit of hope ! Our institute wants to start organic tea production. 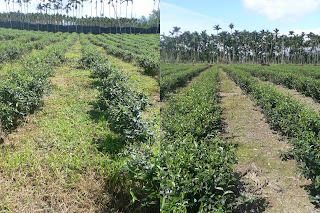 We select tea plantation that before the chemicals (just fertilizers) were applied. Now, we want this garden as a first garden for this use. How long does it take that chemicals effects go? How long dose the garden consider as organic cultivation? Could you please introduce us a valid instruction to start organic agriculture. Which organization do you recommend to follow its instructions that will approve our product after practices? Thank you very much for your comment. I'm glad to see that Iran wants to cultivate tea organically. There's nothing wrong with this 'green revolution'! Anyway, I guess it depends how much residues are in the garden. You will want to test your tea after each season and see if it contains chemicals from the pesticides and fertilizers used in the past. Many chemical laboratories should be able to perform those tests. Ask the chemistry department of your local university for help. Either they can perform the analysis or they can tell you who can. As soon as the results drop to insignificant levels, your tea garden can be considered organic. Many gardens in Taiwan have gone this road and show that it's possible. The plantation isn't mine. I can't plant anything anyway. But the reason farmers don't grow anything else is that they want the tea leaves to receive the nutrients from the soil. That's why even organic farmers remove weed with mechanical means.